My guide to Legian Bali, including the best places to stay, eat, visit and have fun. Legian is the next town north of Kuta and south of Seminyak located on the west coast of Bali, it is generally the more upmarket area compared to Kuta, but not as up market as Seminyak. This is where Kuta blends into Seminyak with lots of restaurants, bars and markets but you can still find a bargain. The Legian area is full of shops from street markets to designer brands, and is a little more hip yet still affordable. Legian beach continues on from Kuta Beach, but you’ll find more sun chairs by the water. Legian offers lots of outdoor dining. Don’t forget to enjoy a sunset cocktail at one of the many beachfront resorts or bars. Legian beach is set between two of Bali’s most famous beaches, Legian has a mix of the surfing Mecca scenes of Kuta and the partying crowd of Seminyak, and is an ideal recreational place where you can shop, swim and go for leisurely walks along boutique and restaurant lined streets. Most of Legian can be covered on foot if you are not in a hurry, but taxis are plentiful as are motorbike rental outlets. Expect to pay Rp 50,000 to 80,000 per day for renting a motorbike. Metered taxis (taksi berargo) are ubiquitous on the streets of Legian and are a relatively cheap and reliable way to get around, especially at night. Avoid any taxi where the driver refuses to put the meter on. Legian is reached by the main Jalan Ngurah Rai bypass from points north (Denpasar, Sanur and Ubud), and south (Jimbaran, Nusa Dua and Uluwatu). 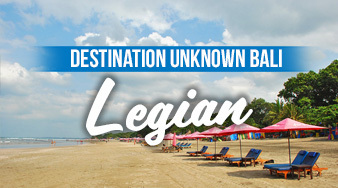 Legian is connected by bus routes from all areas of Bali. There are various scheduled shuttle services including Perama. Perama shuttle buses to Kuta leave from Sanur, Ubud, Candidasa, Padang Bai and Lovina. Balibelly.com’s Kuta Beach Surf Cam provides surfers with a real-time visual reading of conditions at Kuta Beach, Bali. Every 10 minutes the camera takes a tour from Kuta Reef – Kuta – Halfway – Benesari – Padma – Legian. It is hosted by Pullman Hotel.